Coming Soon Our Stewart Water Tower Shirt Fundraiser! Welcome! Our dream is to transform Stewart's historic Red Owl building into a Red Owl Museum and Community Center. We are a 501c3 nonprofit. Larry and Virgene continued to run the business for another 20 years under the name of Larry's Red Owl. At one point even opening up a second location in town. When Supervalu acquired Red Owl in December 1988 It was decided to continue using the Red Owl name. In 1990 Larry's Red Owl became the last grocery store in Stewart. Larry's Red Owl continued to operate until 2001. Friends of the Stewart Red Owl was started in 2013 to acquire Stewart's historic Red Owl Building and restore it as a community center with space for a Stewart and Red Owl museum. Sadly years of no maintenance and vandalism have taken their toll on the building and it needs a restoration work (most pressing a new roof) before we can use it. We have partnered with the Preservation Alliance of Minnesota to help us out. 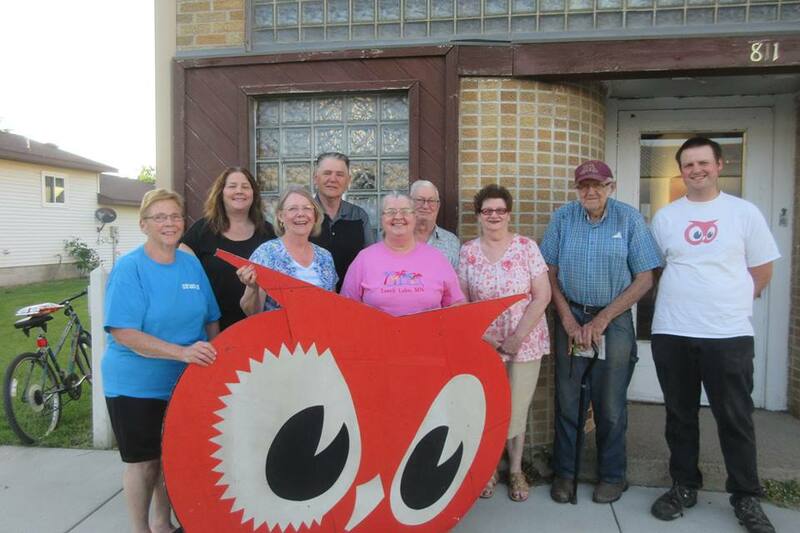 In April 2018 Friends of the Stewart Red Owl Became a member of the McLeod County Historic Partnership. In July 2018 we changed our name to The Stewart Area Historical Society But Our goal remains the same. In December 2018 we became a 501c3 nonprofit. Your donation is tax deductible and will help us realize our dream of saving this historic building for future generations. Want to learn more? Check out our News Articles Page for stories about our project!